Hot sauce, chili sauce or pepper sauce refers to any spicy sauce made from chili peppers and other ingredients. There are thousands of varieties of hot sauce. There are many recipes for hot sauces - the common ingredient being any kind of peppers. A group of chemicals called capsaicinoids are responsible for the heat in chili peppers. The peppers are infused in anything from vinegar, oil, water, beer and alcohol to fruits and vegetable pulp. Additional ingredients are often used, including those used to add extra heat, such as pure capsaicin extract and mustards. Mexican hot sauce typically focuses more on flavor than on intense heat. The sauces are hot, but the individual flavors of the peppers are pronounced. Vinegar is used sparingly or not at all. Chipotles are a very popular ingredient of Mexican hot sauce. Some sauces produced in Mexico are high-vinegar-content similar to the American Louisiana-style sauces. Mexican-style sauces are also produced internationally (e.g. Huffman's Hot Sauce and Kaitaia Fire from New Zealand). Some less hot sauces, like achiote or adobo, are used basically as part of some dishes, but they are used as a condiment, too. Sometimes they come in a green variety. United States: Most often called hot sauce, they are typically made from chili pepper, vinegar and salt. Peppers used are often of the varieties cayenne, jalapeno and habanero; chipotles are also common. Some hot sauces, notably Tabasco sauce, are aged in wooden casks similar to the preparation of wine and fermented vinegar. Other ingredients, including fruits and vegetables such as raspberries, mangoes, carrots, and chayote squash are sometimes used to add flavor, mellow the heat of the chilis, and thicken the sauce's consistency. In large pan, heat oil over medium heat. Add ground beef, salt and pepper. Breaking meat up as it cooks, cook until no longer pink. Remove ground beef to a paper towel lined dish to drain. Add onions and bell pepper, stir, cook about 4 minutes. Return ground beef to pan, add remaining ingredients, stir well. Bring to boil, reduce heat to low, cover, cook about 20 minutes, until rice is tender. Enjoy! Red rice looks spicy and yummy !! Seems interesting to eat with Louisiana hot sauce. I like it! Economical AND tastey, I'll have to try this! Thank you Margaret! I hope you enjoy! I love the combination of flavours. It looks really tasty. I like rice of every color! Perfect spicy dish to warm you up during cold weather! Love it! 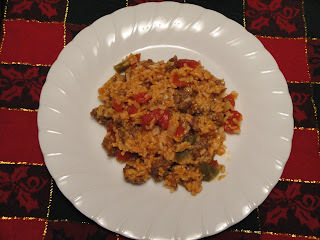 This is an interesting variaton on a Cajun dirty rice dish. Looks great!